On Saturday night, two questions were frequently posed to the audience to answer loudly, please. One: Are you having fun? Two: Isn’t Ringo great? The answers are “Yes” and “Maybe not.” While this weekend’s Bowl audience was undoubtedly rocking out, it’s difficult to qualify what makes the former Beatle (and all-around archetype of modern jollity) fabulous, let alone great. His own portion of the show, besides drumming — with much assistance from a second drummer and percussionist — made up for approximately one-half of the set’s numbers, consisting of all his Beatles favorites, a couple of new songs, and some of the radio hits from his 1970s solo career. All were delivered kind of lounge-y, crossed with peace-and-love preaching. They sounded good, but they got lost in the shuffle. The other half of the concert was more like a 1980s open-air AOR radio show featuring members of Ringo’s All Star Band, including Gregg Rolie, who led note-perfect reproductions of his old band Santana’s biggest hits and, thankfully, didn’t delve into the Journey catalog. But there was also Richard Page, the unconscionably horrible frontman for the terribly derivative band Mr. Mister. Sitting through a live version of the arch-insipid “Kyrie” is the last thing I thought I would do in my precious waning years. On the other hand, band members hailing from equally unlikely places provided some great surprises — like Steve Lukather of Toto, who proved himself something of a revelation with the overplayed “Rosanna,” which was an unexpected delight. Likewise, Todd Rundgren, who might have performed something by Nazz but also fell into a 1980s swoon, was the only musician onstage who seemed to be taking crazy chances: The ascendancy of the Utopia hit “Love Is the Answer” was a complete (good) surprise. So what about the alleged star? He sang well for a 74-year-old, looked trim and bouncy, and connected with everything he sang from his Beatles years. There were hits, like the great song “Boys” and the grand finale, which included the opening number from Sgt. Pepper’s Lonely Hearts Club Band. It all took you back without much of a light show or any real insight. 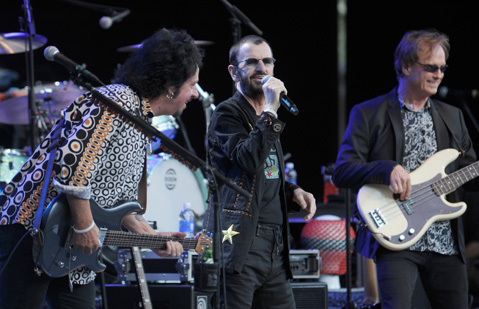 So Ringo got by, but with a lot of help from his friends.